Three PhD Dissertations on Jazz - I Won’t Write. As I concluded my graduate work toward my MA in music composition at CUNY (including my thesis piece, a two-movement, atonal string quartet), there was the immediate, somewhat knee-jerk assumption I would move right along into the PhD program in composition. I didn’t - and since then, the earth has cooled considerably. Now, if I were to pursue a PhD, I’m fairly certain it would be in jazz studies. But as the years roll on, even that seems unlikely. Consequently, I’m prepared to throw open for consideration - and surreptitious appropriation - three subjects for possible dissertations. 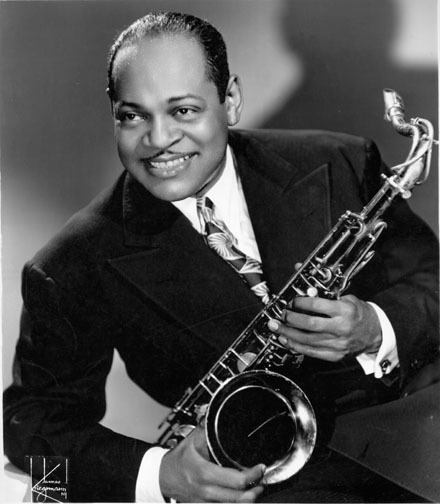 When Ken Burns made his milestone documentary “Jazz” (2000), he used both Louie Armstrong (1901–1971) and Duke Ellington (1899-1974) as referential, connecting threads to help ground his story’s chronology and construct. After all, both Armstrong and Ellington were there at the beginning of Jazz’s luminous second generation of players and composer/arrangers (the first generation - Buddy Bolden, etc. - being extremely under represented by recordings – if at all). Both Armstrong and Ellington lived well into the period of avante guarde and free jazz. Their deaths, in fact, came at a time when a good deal of jazz had settled into a comfortable and more commercial homogenization of late swing and be-pop. Armstrong, by virtue of his historic longevity, tremendous commercial output, and highly affable and accessible media personality, provides a strong emotional tie-in for Burns’ 19 hour opus. As an innovator, however, no one would argue that Armstrong continued to evolve past the mid 1930s. Ellington did evolve, however. As a composer, he continued to grow harmonically, rhythmically and structurally. So, it is more with Ellington in mind that aligning the study of jazz with the ongoing and cutting edge development of a seminal performer, such as tenor sax giant, Coleman Hawkins, strikes me as compelling idea and a justification to take yet another, but hopefully, different PoV for an in-depth study of jazz (By the way, if you can find a like performer that would qualify for a similar study – I’d love to know about it). Coleman’s discography begins in 1921 as a 17 year old sideman for blues “Queen”, Mamie Smith and her “Jazz Hounds”. Listen to the down and dirty, polyphonic instrumental ensemble on “Crazy Blues”- and then compare that to Coleman’s tenor sax solo (not to mention the rest of the very well, and tightly arranged, Fletcher Henderson Orchestra) in the 1924 recording of “Sugar Foot Stomp”. Now, imagine the same instrumentalist playing with Django Reinhardt, Charlie Parker, Dizzy Gillespie, Thelonius Monk and Max Roach - to mention just several great and innovative musicians. But before you explore those recordings, listen again (and how lucky for you if it’s the first time), to Hawk’s 1939 recording of “Body and Soul”. This, in my estimation, would be the centerpiece, the “golden mean” of this suggested dissertation. As well as the place and time that Hawkins became an undisputed leader in the world of jazz. The late Lance Hayward - the blind and gifted jazz pianist from Bermuda - used to play solo at the Village Corner on Bleeker Street in Greenwich Village back in the 1970s and 80s. Given there was no cover charge, inexpensive brews, and Lance’s very long sets, it was an irresistible opportunity to hear really fine jazz piano. During breaks, Lance was accessible and available for conversation – no matter how pretentious or silly. “The only thing I know”, said Lance, rather modestly, while snapping his fingers, “is that you feel the beat on two and four. Jazz is on two and four.” (If you’re unsure what this means, watch video of Sinatra snapping his fingers along to Nelson Riddle arrangements). 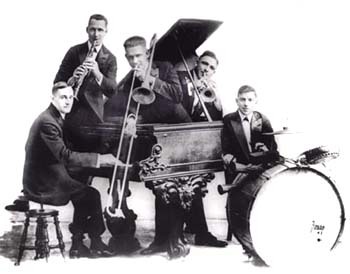 The "Original Dixieland Jazz Band" as they appeared in 1917. (Note the size of the bass drum). But Lance’s definition would exclude most everything from the earliest days of jazz recording (arguably beginning in 1917 with the “Original Dixieland Jazz Band”) through mid-period swing (into the late 1930s) and a lot of Latin feels that are essentially 8/8. Of course, this is where it becomes interesting. The general notion of swing is that it has become standardized. Having written more instrumental theater arrangements then I’d care to admit, I’ve been asked consistently over the years if a particular arrangement, or passage, is “swung”. If I say “swing it” - amazingly - everybody seems to have a great sense of the same, if generic interpretation. In fact, the majority of performers would assert exactly how a writer should represent swing through actual notation. (With no automated notation available, I’ll describe what everyone probably expects: If, by example, a line is comprised of ten “swinging” eight notes, the “swing” conversion would be notated by five triplets; the first sound ((within each triplet)), being represented by a quarter-note, and the second sound by an eight note). And yet, the earliest recorded jazz (1917-1930) defies this application of conventional swing. Listening to the earliest ensembles, we hear swing expressed as a feel somewhere between syncopated march-time and a more relaxed triplet feel; oft times occurring in the same recording, and represented by different players. A great example of this occurs in any number of Armstrong’s solos from his Hot Five and Hot Seven recordings (1925-1929). Listening to Armstrong’s double-time passages (clearly nascent versions of Lance Hayward’s two-and-four swing), one can’t help be struck by the jarring juxtaposition his sense of swing evokes when compared to the older style of his colleagues. The supplantation of tuba by string bass. Of course, if your goal is not to write this dissertation, but to recreate the sound and integrity of early jazz ensembles, ignore a. (Jelly Roll Morton and his Red Hot Peppers re-creationists, excepted), and b and c.
My third possible subject for a jazz dissertation is undoubtedly the most difficult to execute and substantiate, clearly (or perhaps because there’s lack of clarity), the most theoretically convoluted, and – for the aspiring scholar and musicologist – the most risky and dangerous. In other words, it’s potentially the most worthy of the three. Putting aside cinema (which organically grew with, and was inextricably bound to the invention and ongoing development of film as a medium), has anyone ever attempted to link the development of an art form with a particular mechanical media in such a holistic manner? Surely the early recording process must have had a developmental impact on an art form increasingly based on improvisation? The germ of this idea actually began when listening to a 1906 acoustic recording of Mimi’s aria from Puccini’s La Boheme, Si, mi chiamano Mimi . At one point I realized I was hearing an echo of Mimi’s aria in the orchestra played by a flute, instead of its usual representation on harp, as orchestrated by Puccini. This had everything to do with the technology of the one, or two horn, acoustical recording process unable to capture the delicacy of the plucked harp. Needless to say, technology caught up with the finer points of Puccini’s instrumental and vocal requirements, as it did with all preexisting and subsequent orchestral, band, choral, and chamber music. I don’t know whether this type of practical substitution annoyed Puccini, or if he even cared about his music being recorded. I’m certain, however, it did not impede his creativity or thwart his development as a composer. Neither did it ultimately misrepresent his intentions. Any music student of 1906 could review Puccini’s instrumentation in his score, or find a performance that faithfully realized the composer’s intentions. But in 1906 sound recording was in its nascency. And so was jazz. Arguably, they grew up together. Further, unlike classical music, jazz was an aural phenomena; its players a mix of educated music readers and “head” musicians. Stock arrangements existed, but were loosely interpreted with actual performances containing worked out, or improvised two-bar breaks and freely expressed rhythmic and melodic tune variations. Without the written scores, which only suggested improvisation amd the use of blues, aspiring jazz players learned by hearing it live or listening to recordings. If we assume the conductor and sound engineer accommodated the limitations of the recording process by swapping out a harp for a flute in the 1906 La Boheme aria, what might the impact have been to the earliest jazz recordings, and in-turn, how did the perception formed through those recordings impact jazz’s development? In other words, what degree of musical compromise are we experiencing in this early collaboration between musician and engineer? 2. Drummers tended to favor woodblocks, which were audibly much brighter than snares and tom-toms and cymbals. 3. Tracks weren’t mixed – players were mixed. (e.g., the classic tale regarding Louis Armstrong being told to stand 10 feet behind his first recording ensemble, “King Oliver’s Creole Jazz Band”, because of the power of his sound). 4. In general, recording could be decently or poorly mixed through the positioning of players. 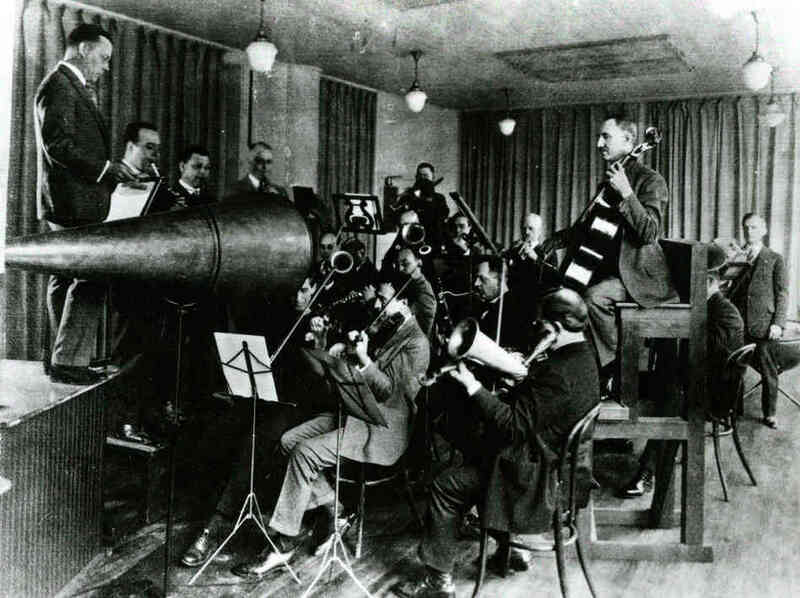 Poorly mixed recordings were particularly injurious to the polyphony of early jazz. 5. The state of recording actually made piano-rolls a viable alternative into the mid 1920s. In conclusion - -any takers?